Students in Sarah Cappelli's art classes worked daily during the winter/spring semester to create a 5' x 12' ceramic timeline mural that delved into the history of the site of their school, which was built in 2007 on land once occupied by the Gorham Silver Manufacturing Company. UPP founder Holly Ewald brought in research materials to teach the students about the history of the site from pre-colonial times to the present day. Sam Hough, a silver historian, showed the students a 1927 film about Gorham Silver to provide further context for the project. Deb DeMarco, a ceramic artist, met with the students twice a week to teach them how to prepare clay for making tiles and large slabs. Students learned the clay techniques of etching, relief building, impression making, carving, and glazing. In addition to learning about the past, they envisioned future designs for the site—with ball fields for the school, a public park, rain gardens replacing asphalt, and windmills for power. "On my first day working at Alvarez High School, I noticed a beautiful mural in the cafeteria. While looking at it, a student approached me and pointed out the tile of a snake and a couple other pieces that she had contributed to the mural last year as a part of her art class. This led to her telling me about the history of Mashapaug Pond and how the community is working to raise awareness and clean it up for future generations. 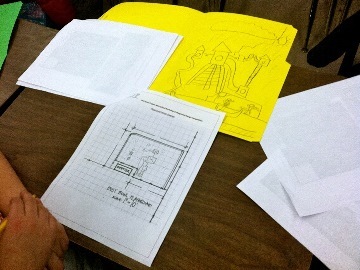 It was clear that this student understood the importance of this work and was proud to have been a part of the project." 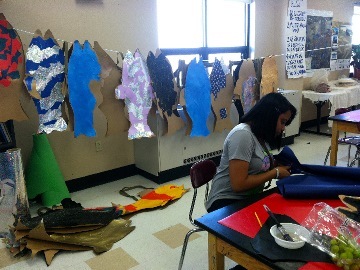 Ms. Cappelli's art classes also made over forty fish costumes for participants to wear at the procession. They cut cardboard into fish shapes, collaged colorful papers from the recycle center onto both sides of two shapes, and decorated the fish with papers and glitter. With two straps attached, the fish costumes are easily worn by procession participants of all ages. Thank you to Ms. Cappelli and all her students. They are a much-needed addition to our costume supply! We look forward to working with Alvarez art students again next year. "When I got to the Alvarez on the day of the procession I was struck by what a great job this event is doing in raising a new generation of activists. The children involved will always remember how much fun it was to participate in such an important event. The committee should be proud of having an influence that is much bigger than just 'our own pond.'" 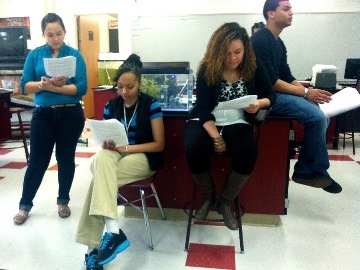 In collaboration with Amelia Rose, Director of the Environmental Justice League of Rhode Island, UPP helped students in Dave Evans's AP Environmental Science class create Toxic Legacies, a video about the history of the site of Alvarez. First semester, Amelia brought in research materials, including videos and oral histories generated by Brown Public Humanities students, as well as special speakers Lucy Boltz (Brown Public Humanities), Will York (smallFeat for Schools), Tom Ardito (URI/Narragansett Bay Estuary Program), Jenna Cragan (marine chemist and Elmwood neighborhood resident), and Becca Buckler and Jeehye Lee (Northern RI Conservation District). These presentations grounded the students in content to help them develop their video. Toxic Legacy... from Urban Pond Procession on Vimeo. Second semester, artist David Stephens joined the team and taught the students the basics of videography. With Amelia, David, and Holly's assistance, the students developed a script, gathered images, and took turns behind and in front of the camera. 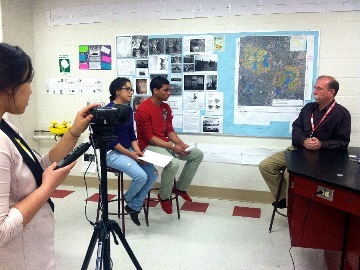 Interviews included fellow students; Alvarez staff; Bob McMahon, the Superintendent of Providence Parks and Recreation; and Greg Simpson, the Senior Project Manager at Textron who is overseeing and coordinating the remediation of the Gorham site. The class screenedToxic Legacies at Alvarez's dedication ceremony of the ceramic timeline mural created by the school's art students. The video is a valuable education tool for others to understand the environmental history of the site. "The Urban Pond Procession fits in beautifully with my goals as an educator at Alvarez High School. I want to see my students develop connections between what they learn in the classroom and what is happening in their community. 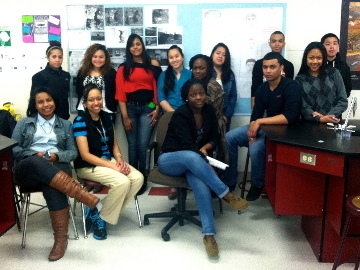 And UPP has assembled a remarkable group of people who have enriched the classroom experience of my students." At Reservoir Avenue Elementary School, just five blocks from the boat house on Mashapaug Pond, the whole school community shared ideas of what could replace a 20' x 35' patch of bare dirt in their playground, colloquially known as the "Dust Bowl." Rather than use the space as a basketball court, as Principal Gomez-Potter envisioned, Holly suggested alternatives that would reduce the impermeable surface of the playground area behind the school. At a PTO meeting in the fall of 2012, she explained to parents how stormwater runoff impacts our ponds and lakes. Parents filled out a survey asking what they felt would be a good use of the space. 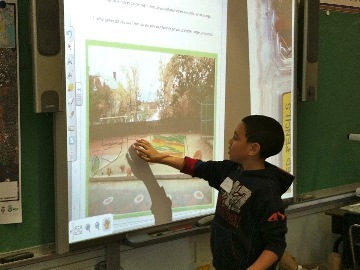 The verdict was to ask the students to design their own play space, keeping rainwater in mind. Working with landscape architects Sean King and Josh Lantzy, as well as artists Lisa Melmed and Jamie Topper, seventeen 4th grade students met once a week after school for six weeks. They focused on water, playing with ideas about how to capture stormwater for useful purposes rather than letting it run randomly over impermeable surfaces, collecting debris and ending up in storm drains that lead to our ponds and rivers. Here are some of their designs. "We want the world to be healthy, to pick up trash and dog poop, because all that goes into Mashapaug Pond. When it's raining it all slides down into the drains." "Me and Alexis, we just pretty much took my drawing and added a bush. And instead of having just one pipe, we had a lot of pipes, because rain falls all over the place. The pipes are meant to catch the water and water the bush." Working together brought out more ideas. We got cool ideas during the week. We got cool ideas from different parks and even at home. I got an idea from my neighbor—make a planter out of an old tire. The Dust Bowl Project at Reservoir Elementary School from Urban Pond Procession on Vimeo. 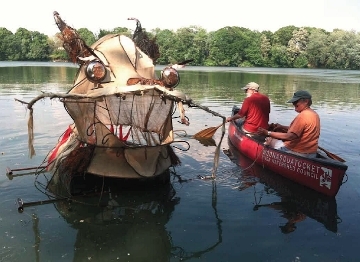 Inspired by the idea that our industrial culture has turned Mashapaug Pond into a toxic monster, teaching artist Juliette Casselman wanted to create a good monster that would symbolically eat up all the toxins. She shared her design ideas with Howie Snyder at the Steel Yard, and artist Frank Barada did the fabricating. Once the metal structure was complete, Juliette covered it with burlap, grasses and plants. 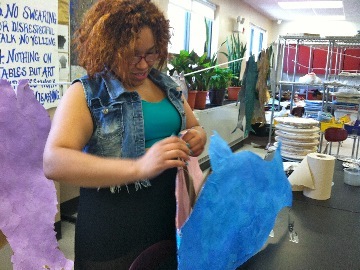 To create the monster's tail, she enlisted the help of ¡CityArts! students, who combined art and environmental science to inform their process. She worked with eight 6- to 10-year-olds, who used willow branches, basket weaving reeds, cedar wedges, wire, rope, and copper/aluminum sheeting. The students compared how creatures in the wild and humans build using the same materials. They also created homes for animals living near the pond, such as birds and squirrels. On a visit to Mashapaug Pond, they drew from their surroundings and learned about stormwater run-off from Elizabeth Scott of RI DEM. Through classroom discussions and input from science educator Will York, the students learned more specifics about urban runoff and groundwater. They then created a tongue with names and symbols of toxins such as fertilizer, arsenic, chlorinated solvents, oil, and pesticides using black and white paint on red cloth. The Mashapaug Monster joined the procession at the boating house and glided through the water parallel to the procession route. With the monster joining us at JT Owens ball field, our fearless procession choreographer Lisa Abbatomarco performed a ritual extraction of toxins from the monster's mouth by pulling out its tongue. In the spring of 2013, teaching artist Lisa Melmed worked with ¡CityArts! students aged 10-11 to create short animations about Mashapaug Pond, incorporating messages about pollution, stormwater runoff and stewardship. The animations were shown at UPP's 2013 Summer Series Send-Off in late September. 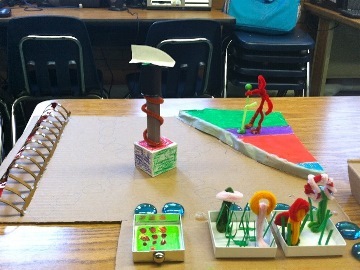 Mashapaug Pond Animations- ¡CityArts! Spring 2013 from Urban Pond Procession on Vimeo.